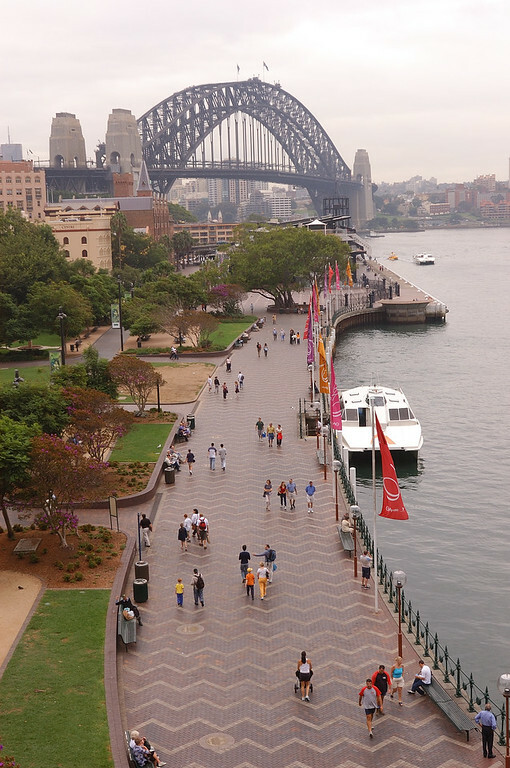 Mark Phillips' Pages: Workbook: 3/12/04: Sydney was evidently designed by someone who plays a lot of SimCity. Mark Phillips, March 15, 2004, Circular Quay at the Museum of Contemporary Art, Sydney, Australia. Sydney was evidently designed by someone who plays a lot of SimCity. Building public spaces alongside waterways and other lovely, high-value locations is a marvelous way to drive up property values nearby. You find parks and walkways all along the harborside with superb, beautiful, expensive houses and condominiums set tactfully back, so that these private spaces become part of the value of the public ones, and vice-versa. In the States the site of the Opera House would be owned by Exxon, or Microsoft, unquestionably. There'd be a huge tower there designed explicitly to monopolize the view and the public infrastructure necessary to support it. The corporation would look upon the building as advertising, supported in large measure by the public via tax concessions and other subsidies; its purpose would be to considerable degree to prevent the public from enjoying the vista apart from its corporate identity. Here the scale of the architecture and the form of the parks and open spaces is inherently more organic, in large part I think because it was designed for public use rather than private. This is one of the stronger practical suggestions for what art might look like under genuinely democratic socialism. Public art, like the Greeks, designed to celebrate public spaces rather than obscure them. That all or nearly all aspects of public life would become aesthetisized seems inevitable to me. Only in our dreams, sadly.